Last week MJ Chun was in Utrecht, the Netherlands, to show The Sims 3 just in time before the release. Since the last base game, The Sims 2, there have been eight expansions and nine stuff packs. Now it's time for a sequel again. The Sims 3 is coming in a few weeks time, and we take a look at some of the things it has to offer. Please note that this is a preview. We didn't have time to check everything out in the few hours of play time we got. We may have misinterpreted things, et cetera. It isn't even sure if it was a final version of the game, meaning things may have changed a little in the final version. Also, some information comes from a presentation held in November by Ben Bell (also in Utrecht), so information may be outdated. Feel free to contact us so we can correct that, though! Those things aside, let's get on with it! 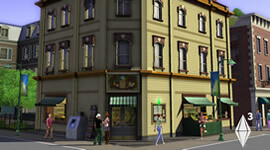 The Sims 3 is set in Sunset Valley. This is an early version of Pleasantview. That's right, we go back in time with this sequel. While you can create copies of this hood (some reports say up to 4, but we haven't been able to confirm this ourselves), it will at first not be possible to create your own neighborhoods as in the Sims 2. Instead you'll have to live with - and in - this one neighborhood. The neighborhood's planning is also already done: lots can't be placed freely in the area anymore, but you'll have to stick to the predestined places you have. You can move houses and buildings around, though. EA will provide a new neighborhood shortly after the release, Riverview. While in November Ben mentioned a tool would probably be made so that we can create our own neighborhood terrains, this is now unsure. 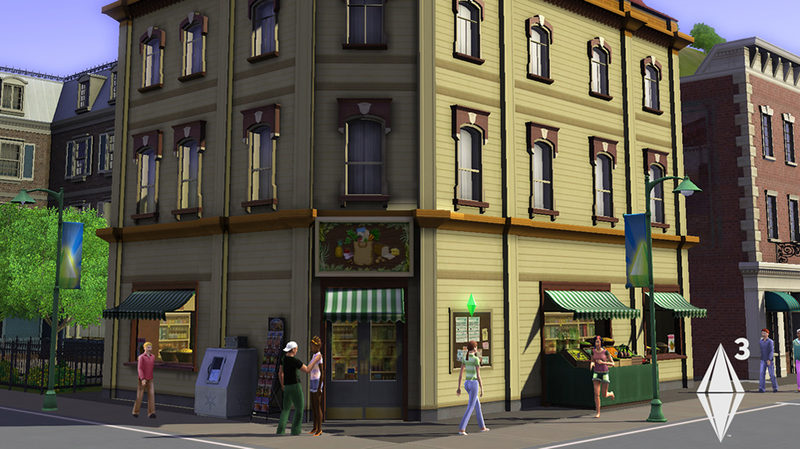 In Sunset Valley you'll find everything a sim needs: homes, parks, shops, a town center, and places to work. You can't actually enter the latter (you'll only see your Sim go on, but you can't really follow your Sim inside the building), but otherwise you can go pretty much anywhere you want. The other sims you meet in the town will almost always live somewhere else in Sunset Valley. The NPC's won't though, they'll come from outside the controllable world. One of the main changes in the game is how the locations are treated in the game. Previously you had to wait for the game to load every time you changed locations. No more. The Sims 3 is an almost seamless game: you can go from anywhere in the neighborhood to some other place by zooming out and back in. Back on a location, you'll see everything build up for a short while, but that's it. It takes only a few seconds to completely load the location. Those who have played Spore may notice some of the similarities in this way of loading up houses. This means you'll see only a few loading screens, for example when opening the neighborhood. The loading screens that you do see occasionally are not very intrusive. Instead, the background is blurred, and a spinning wheel is put over it. This means the transition between loading and playing is smoother and less abrupt. One of the other major changes is how time works. Rather than loading up a single household, playing it, and noticing how time stops in the rest of the neighborhood, time now moves on. There is an option to disable big events from occuring automatically (marriage, for example), but otherwise the neighborhood is one vivid place moving forward in time. This implies that whenever your Sim goes to a community lot or anywhere else in the neighborhood, time moves on. You can send one of your Sims out to a park, and leave the rest at home, but you'll have to do your best to control them all at the same time. This change may be too radical for some players. On the other hand, it does make it easier to keep the ages of generations more consistent, as everybody will grow up at the same time. To make things a little easier for you, some other things have also changed. Free Will has now three settings: off, normal and high. When off, Sims will not do anything you don't tell them to. We weren't able to directly find out the difference between the normal and high settings, but with high free will we assume Sims will do more by themselves, including taking care of themselves. So Sims can still miss the toilet, but it's more likely that you have to tell them to. Another setting is the age of Sims. You aren't stuck with the default anymore (although you can hack the default ages in the Sims 2). Instead, you can choose how old your Sims will become: 25, 50, 90, 190 or a whopping 960 simdays. The default is 90, slightly longer than the average lifespan of the Sims 2. Unfortunately the jump from 190 to 960 is a little high. A few more extra settings in between, or even completele flexibility by entering the number of days manually would be even better than this, but it's definitely an improvement from the Sims 2. Of course you can always kill off Sims early. We haven't found out if there's elixir to extend your Sim's life, nor do we know if fulfilling a lot of wishes (more about those later) has any positive effect on the lifespan of your Sims. If you don't like your Sims getting older at all - maybe even temporarily - you can turn the aging off through the options. You no longer need to use cheats for that. 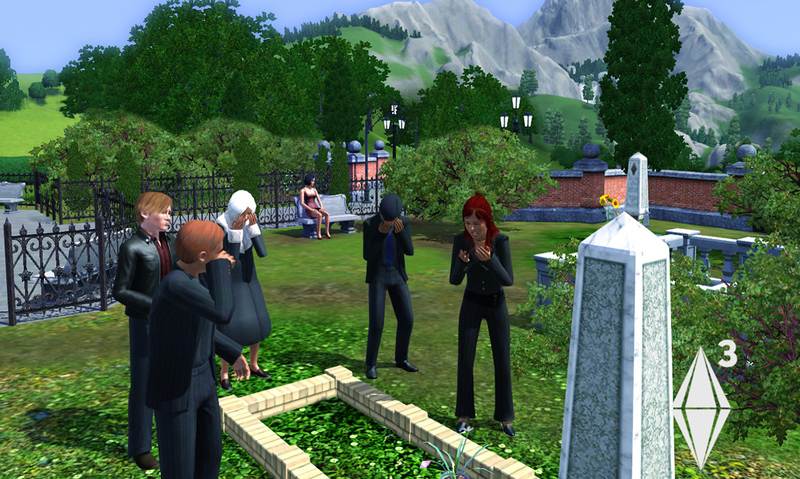 The 6 stages of life for a Sim haven't changed much: baby, toddler, child, teen, young adult, adult, elder and ghost. Young adult and adult basically form what we now know as the Adult stage in the Sims 2. Young adults don't go to college or anything, so they aren't students, but the adult stage has just been split up (which, in real life, would probably cover the ages 25-65 or so). The game focuses on the young adult and adult life stages, which are most likely the longest. It depends on your settings of course, and we didn't exactly catch the default length of each stage. Also, it's not really clear how the setting changes affect the durations of each stage. It could very well be that on the setting of 960 days, your babies won't grow up for 30 days (rather than just stretching the adult/elderhood of your Sims). Hopefully at some point, we'll reach the possibility to flexibly tweak the duration of each stage in life ourselves. Think about it: we could choose to have our Sims be toddlers for 90 days, then children, teens, young adults, adults and elder for only 3 days each. Wouldn't that be fun? As time progresses you will also have to regularly activate other households to play their story too. This is a little bit cumbersome: you'll need to exit the live mode, and go to "edit" your neighborhood (there's a bit of saving/loading going on here). Then you'll have to change the active household, and go back to live mode. There's no way that we found out to directly switch the family you're playing without leaving to the edit mode. Also, when changing the active household in the neighborhood, you'll lose the promises and wishes of the Sims you played. This makes sense in a way: if you don't play them anymore for several Simdays (or even a generation), the promises may not be relevant anymore. On the other hand it seems that because of this, it isn't easy to fulfill wishes and promises of other sims by playing another household in the neighborhood. As mentioned before, you can create multiple copies of your neighborhood and so get a separate (moving) neighborhood for each household you play. This (probably) has the downside that relationships changed in one game/household will not affect the other families, so it's all up to you how exactly you'll play. While we're at it: pressing Ctrl+S to save the game didn't seem to work during the demo. One of the big selling points of the Sims 2, developed in the extra half year they got when that was delayed, were the aspirations. Six tracks (later expanded to 8 in total, including "Growing up") defined the wants and fears of your Sims. The Sims 3 has a much more granular approach: traits. A newborn starts with 1 trait, an adult created in Create A Sim gets up to 5 of them. There are over 60 to choose from in total, and more may be added in expansion packs. Think stuff like Flirty, Excitable, Hot-Headed, Charismatic, Couch Potato, Computer Wiz, Genius, Inappropriate, Family Oriented, Loner and many more. The traits allow you to create Sims just like in the Sims 2: hopeless romantics, family sims, Sims thriving for knowledge, wealth or pleasure, party animals, and so on. But the traits give you more control: you can more or less freely mix up these aspirations by simply giving your Sim the traits you want. This gives you the perfect family oriented, genius computer whiz that you've always wanted to play. Or somebody totally different. Along with these traits you can determine a lifetime wish, when creating the Sim. Such a wish is linked to the traits you give your Sim. There are about 30 of such lifetime wishes that you can choose from, including a mysterious one we saw while playing the game: "Creature-Robot Cross Breeder." Another example is "Master of Arts." You can think of the lifetime wish as the lifetime aspiration goal in the Sims 2: a big goal which yields many lifetime reward points (see below). The main change here is that - at least when creating a Sim - you get to pick the goal out of five that you want your Sim to pursue. Besides the lifetime wishes, there are smaller wishes - pretty much like the wants in the Sims 2. You get more control though: you can accept and reject wishes. Basically that means that while playing, you can promise your Sim things like "you'll go fishing soon". Completing a wish makes your Sim happier. The aspiration gameplay from the Sims 2, or astrological signs, are no longer there. The same goes for fears: you can make Sims happier by fulfilling wishes, but the fears are gone. All wishes boost your Sim's lifetime happiness. Much like the current (lifetime) aspiration points, there are points you can earn for lifetime happiness. These points can be exchanged for rewards again. Lifetime wishes earn you many points, while the smaller wishes typically get you less than about 1,000 points (some of the larger, regular wishes yield better results). Some of the lifetime rewards are traits, while others can give your sim certain special powers. Think of rewards like "Extra Creative," "Complimentary Entertainment," "High Roller," "Fast Metabolism," "Steel Bladder," "Professional Slacker" and so on. The costs for these rewards differ: from what we saw in the presentation in November, the cheapest are around 10,000 points, others are much more expensive (back in November the most expensive one was 50,000 points). We haven't been able to confirm ourselves if the costs vary per sim or if they are the same for everybody. A nice example is the "Mood Modifier" which can be used to change other sims' moods by zapping them. It can result in the other sim passing out though, so as known from the Sims 2, any extra achievement can turn out good or bad. Some may be a little vague, but it looks as if there are boosts for all needs and several skills, at least. 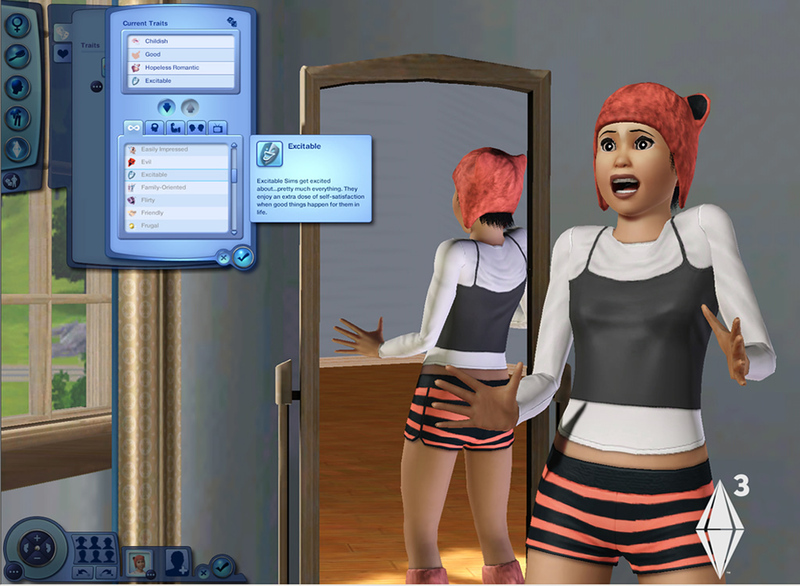 Others change the gameplay such as the Mood Modifier explained above, or the Mid-Life Crisis with which it's possible to completely reset all your Sim's traits. Written at 08:22 on Friday 22 May 2009 by ChEeTaH.